Portadown striker Darren Murray has withdrawn his transfer request on the eve of his side's big Irish Premiership clash against Cliftonville. The 23-year-old front man had asked for a move from Shamrock Park in June, with Cliftonville appearing to be his most likely destination. Murray returns to the Ports squad on Saturday having missed the midweek win over Warrenpoint because of suspension. Portadown, Cliftonville and Linfield have won their opening two fixtures. "Something has got to give and and it should be a really good game," said Cliftonville manager Tommy Breslin who had made no secret of his desire to sign front man Murray. Cliftonville have been looking for a striker to replace their record-breaking top scorer Joe Gormley who moved to Peterborough United during the close season. Linfield top the early standings on goal difference and the Blues host Dungannon Swifts on Saturday. 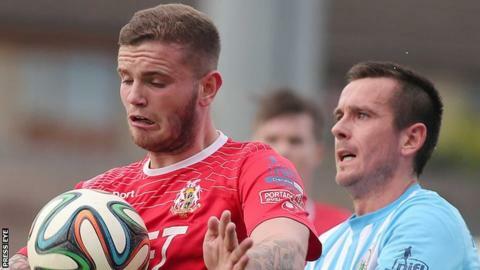 Join presenter Joel Taggart for Saturday Sportsound with Portadown's clash with Cliftonville the feature game. Michael Hammond and Philip Mitchell will take you through the Shamrock Park action while Eric White and Tim McCann are on commentary for the derby between Ballymena United and Coleraine. The programme also includes updates from the other four Premiership game and the latest cross-channel news. Carrick Rangers defender Aaron Smyth is set to miss the Taylor's Avenue clash with Glentoran after sustaining a leg injury in Wednesday night's defeat by Linfield. Glens keeper Elliott Morris was dismissed four minutes into the 2-2 midweek draw with champions Crusaders and he is suspended. The Crues have made a stuttering start to their title defence, with just one point on the board from two games. But manager Stephen Baxter is in relaxed mood as he prepares for a Seaview encounter against Ballinamallard United. "It's a long league, we had a similar start last year, it's early season and we will not be over-assessing it," he said. "Maybe it's a hangover from playing in Europe but we've played two top teams and there's still 36 games to go. "We've another tough game against Ballinamallard, who have a wily manager in Whitey Anderson and they've brought in excellent players." Ballymena United will aim to bounce back from their 7-1 hammering by Glenavon when they host derby rivals Coleraine. The Sky Blues sit bottom and are seeking their first points along with Warrenpoint Town, who play the Lurgan Blues at Milltown.